In 1998, after two rounds of antibiotics and numerous appointments with a doctor who insisted she could not have cancer because she did not have all the classic symptoms, my mom sought a second opinion. Her new doctor ordered a biopsy of the golf ball sized lymph nodes protruding from her neck. She was diagnosed with stage II B-cell non-Hodgkin’s lymphoma, a cancer that develops in the lymphatic system. The doctor quickly referred my mom to an oncologist. The oncologist placed her on a chemotherapy plan called CHOP. CHOP is an abbreviation for the drugs administered: Cytoxan, Adriamycin (hydroxy doxorubicin), Oncovin, and Prednisone (“CHOP”). The first three drugs were administered intravenously at her oncologist’s office, but the prednisone was in pill form and taken at home. Chemotherapy began in August 1998 and was administered once a month for five months. Immediately following treatments, she was utterly exhausted and slept most of the day. The chemotherapy also made her nauseous. Her vomiting sent our very sensitive border collie mix into turmoil. Mom continued to work, only missing the day of and the day immediately following treatment. She continued strength training and cardio exercise, dragging her tired body to the gym three times each week. Mom took up juicing – mainly carrots – after reading literature about its healing power and took vitamins recommended for use during chemotherapy. Mom made the best of the hair loss that accompanies chemo. 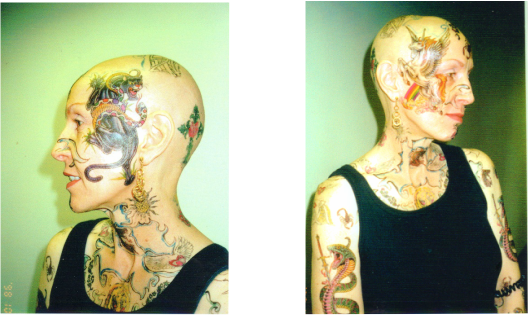 She "dressed up" for her office Halloween costume party, covering herself in temporary tattoos. After finishing CHOP, tests revealed that cancer was still present in her lymph nodes. Her oncologist offered her another treatment, monoclonal antibodies (MABs), which her insurance company would pay for because chemotherapy had not been effective on its own. Rituximab had been approved by the FDA only two years earlier. This MAB was produced using mice; figure 1 shows a simplified description of the production process. The oncologist prescribed Rituximab therapy consisting of four treatments, each given two weeks apart. Her first dose of Rituximab was administered in January 1999. Blood tests performed after the fourth treatment showed that her cancer was in remission. Today, 14 years later, she is still in remission. “CHOP Chemotherapy Regimen for Lymphoma.” Cancer.med.umich.edu. University of Michigan Comprehensive Cancer Center. n.d. Web. 16 Dec. 2013. Figure 1. "Monoclonal Antibodies." Bio.davis.edu. n.d. Web. 16 Dec. 2013.